Entity snaps enable you to quickly select exact geometric points on existing entities without having to know the exact coordinates of those points. 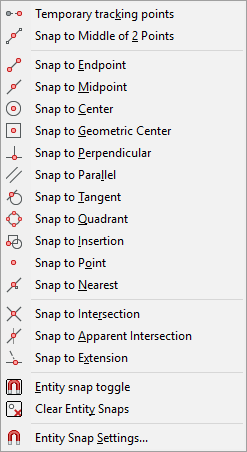 With entity snaps, you can select the end point of a line or arc, the center point of a circle, the intersection of any two entities, or any other geometrically significant position. You can also use entity snaps to draw entities that are tangent or perpendicular to an existing entity. You can use entity snaps any time you need to specify a point. Enable a running entity snap that remains in effect until you turn it off by choosing an entity snap when no other command is active. Enable a one-time entity snap for a single selection by choosing an entity snap when another command is active. You can also use a one-time entity snap to override a running entity snap. When using entity snaps, the program recognizes only visible entities or visible portions of entities. 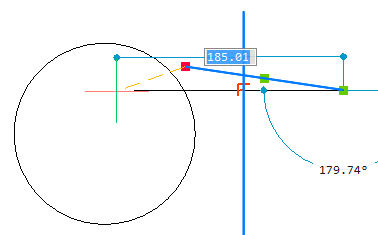 You cannot snap to entities on layers that have been turned off or to the blank portions of dashed lines. If the APBOX system variable is on, the entity Snap Aperture Box is added to the crosshairs when one or more entity snaps are active. When you move the cross hairs, the program snaps to the snap point closest to the center of the Snap Aperture Box . The Snap Marker indicates the current snap point. The DRAGSNAP system variable controls the snap behavior while 'dragging', providing an increased WYSIWIG experience. DRAGSNAP controls whether rubberband dynamics are displayed at the current cursor location or at the current entity snap location. DRAGSNAP applies to all modify commands that display dynamics, such as COPY, PASTECLIP, PASTEBLOCK, MOVE, ROTATE, MIRROR, SCALE and STRETCH. DRAGSNAP = 0 (Default),:dragged entities display at the cursor location. DRAGSNAP = 1: dragged entities display at the current entity snap location. The OSOPTIONS system variable suppresses entity snaps on certain entity types. The value is stored as a bitcode using the sum of the values of the selected options. 1: Entity snapping is disabled for hatch entities. 2: Entity snapping is disabled for geometry with negative Z values when using a dynamic UCS. 4: Entity snapping is disabled for endpoints of dimension extension lines. Press the TAB key, without moving the mouse, to cycle through all possible entity snaps. If the DYNMODE variable has a positive value (Dynamic Dimensions switched ON) entity snap cycling is not possible. Click the DYNMODE field in the Status Bar to toggle the display of dynamic dimensions. In the Settings dialog, expand the Program Options settings class. Under Program Options expand the Display settings group, then scroll down to the Entity Snap settings. Sets the color of the 3d snap marker (default color = 5 (Blue). If OSNAPZ = 1 ( Ignore entity snap elevation) the 3d snap marker displays also at the the identified 3D point, which is then projected onto the XY plane of the current UCS at the current Elevation. The 3d snap marker (1) displays the identified 3d point, the snap marker (2) displays at the current Elevation height. If multiple viewports are open, enables the display of the snap marker in all viewports. Enables the display of the Entity Snap tooltips. 4. Under Drawing expand the Drafting settings group then go to Coordinate Input > Entity Snaps . Sets the entity snap modes and toggles entity snap on/off. Sets the entity snap modes for 3D entity features such as the midpoint of an edge or the center of a face. Determines whether entity snaps override keyboard coordinate entry. 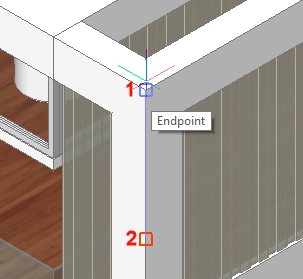 Replaces the Z-coordinate of the snapping point with the current value of the ELEVATION system variable. Suppresses entity snaps on hatches and/or dimension extension lines or negative z-values in dynamic UCS mode. Toggles the display of the aperture box (2). Sets the size of the Autosnap aperture box. (default size is 10). Enables entity snapping to entities in DGN underlay files. Enables entity snapping to entities in DWF underlay files. Enables snapping to the geometry in PDF underlay files. Click the buttons on the Entity Snaps toolbar. The buttons of the currently active entity snap modes are pressed. Press and hold the Shift key, then right click and select the Entity Snap mode in the context menu. The icons of the currently active Entity Snap modes are outlined. When no command is active, the above procedures toggle the Entity Snap modes on/off. When a command is active, the above procedures set a 'one shot' override of the current Entity Snap modes. Alternatively you can type a single letter shortcut as indicated in the table below. Use temporary tracking points. Prompts you to identify temporary points; press Enter to accept the last temporary point. Snaps to a point in the middle between two points. Prompts you to identify two points. Snaps to the nearest endpoint of an entity or polyline segment. Snaps to the midpoint of an entity or polyline segment. Snaps to the nearest point on an entity. Snaps to the center point of an arc, circle, polygon, ellipse or elliptical arc. Snaps to the center of gravity of a closed polyline. Snaps to the centroid of any closed polylines and splines, planar 3d polylines, regions and planar faces of 3D solids. Snaps to the perpendicular point of another entity. 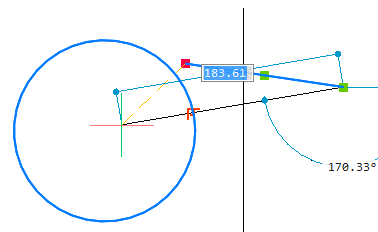 You can snap to an arc, circle, ellipse, line, polyline, infinite line, ray, spline or edge of a plane to form a perpendicular alignment with that entity or with an extension of that entity. Displays a tracking line parallel to the selected entity. Snaps to the point on an arc, ellipse, spline or circle that, when connected to the previous point, forms a line tangent to that entity. Snaps to the closest quadrant of an arc, circle, ellipse, or elliptical arc. Snaps to the insertion point of an attribute, block or text entity. Snaps to a point entity. Snaps to the intersection of any combination of entities. Snaps to the apparent intersection in the current view of two entities that do not intersect in three-dimensional space. Snaps also to the intersection of any combination of entities. Snaps to the extension of an entity or to the intersection of the extension of two entities. Turns off all entity snap modes. * Type this letter to quickly select the entity snap mode in the right click context menu. ** Type the transparent shortcut in the command bar when a command prompts for a point. Other running entity snaps are temporarily disabled. Ignore entity snap elevation: replaces the Z coordinate of the snapped point with the current value of the ELEVATION system variable. Entity snap to hatches: allows to snap to hatches. by clicking the ESNAP field in the Status Bar. by hitting the F3 function key. Move the cursor to the entity you want to snap. One of the active Entity Snap modes markers display. Do not move the mouse; press the TAB key. The entity the snap point is on highlights. Click to accept the snap point. The next possible Entity Snap mode marker displays. 4. (option) Repeat step 3 until the right snap point is found. Do not move the mouse while pressing the TAB key. Entity snap cycling is not possible when Dynamic Dimensions are active. Click the DYNMODE field in the Status Bar to toggle Dynamic Dimensions on/off. If not already on, turn on the Extension Entity Snap mode ( ). Launch a drawing tool, e.g. Draw Line. Move the cursor over the endpoint of the first entity (1). A small cross ( ) indicates the entity is marked for extension. Move the cursor over the endpoint of the second entity (2). Move the cursor near the intersection of the extensions of the two entities. An X indicates the intersection (3). 6. Click to accept the snap point. When using temporary tracking points, Polar Tracking must be on and it is recommended to have dynamic dimensions active as well. Click the Temporay tracking points tool button ( ) on the Entity Snaps toolbar. Hold down the Shift key, then right click and choose Temporay tracking points in the context menu. Type TK in the command bar, then press Enter. The command is suspended temporarily. 2. Enter a point, e.g. use an entity snap to specify a point. Press Enter to accept the last temporary tracking. Click the Snap to the middle of 2 points button ( ) on the Entity Snaps toolbar. Type mtp or m2p in the command bar, then press Enter. Press and hold the Shift key, then right click and choose Snap to middle of 2 points in the context menu. 3. Specify the second point. The point in the middle of the two points is snapped. Make sure Entity Snap Tracking is active. Launch an entity create command to create a linear entity (e.g. Line). Specify the first point of the entity. Press and hold the Shift key, then right click and choose Snap to parallel in the context menu. Click the Snap to parallel tool button ( ) in the Entity Snaps toolbar. Hover the cursor over the entity you want to draw parallel to. The Parallel Entity Snap marker ( ) displays on the selected entity. Wait until a small cross (+ ) indicates the entity is recognized. Move the cursor in order to place the dynamics of the line more or less parallel to the selected entity. A tracking line displays from the start point of the line. Enter the desired length and press Enter. Use a second entity snap tracking point, then move the cursor to the intersection of the parallel tracking line and the second entity snap tracking line. 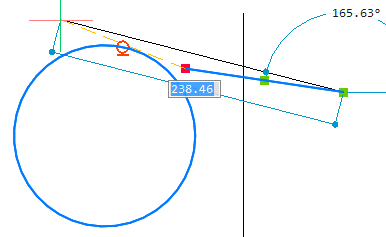 When dragging a grip of a line, polyline, arc or a circle the geometric relation (perpendicular or tangent) of the entity being edited with crossing or nearby other lines, polylines, arcs or circles is indicated. A snap marker displays and the other entity highlights when the current position of the dragged entity is perpendicular or tangent within the distance defined by the APERTURE system variable. This feature is controlled by the GEOMRELATIONS system variable. In the images below the red grip of the line is dragged. Depending on the position of the dragged grip the line is nearly perpendicular to the other line (top) or the circle (middle) or tangent to the circle (bottom). Click when the desired position is reached.